My biggest compliments over the years have come from my ability to create unique vignettes. I have had the pleasure of staging and creating these small, personal design experiences on stage, as well as in boutiques and major retail stores. Most of the time these are sitting areas on porches, kitchen sets, etc. However, what may look challenging, is really something anyone can put together no matter what the occasion. I have several tips to make things easy to pull together great indoor or outdoor summer table settings. Do you have a theme in mind? Even if you aren’t thinking about setting something up for a specific holiday, you will still need to know what kind of mood you want for your summer table settings. Is it going to be all modern? Is it going to be romantic? Is it for a certain holiday? or simply, do you like a specific set of colors? In the northeast, and Philadelphia especially, early American history is part of our everyday lives. We get to live among the treasures and architecture from the birth of our nation. I’ve been thinking about the history and I love anything Americana. I figured, there’s never a wrong time to show your patriotism. A red, white, & blue theme for my summer table settings and parties would be great! Once you have a general idea figured out, start with the table. What is it made from? Is it going to be exposed or is a table cloth necessary? If you’re like me, your outdoor table may have a few, shall we say, imperfections. Tablecloths are a great way to hide imperfections and ugly tables (or the lack of a proper table). If it is a folding or a card table put down a full table cloth. You can use a proper tablecloth, piece of fabric that you like, or a quilt. I am intrigued with the idea of using a quilt. I like the idea of a sophisticated picnic. Consider looking for quilts at garage sales, flea markets, and even eBay. For this centerpiece, I wanted something very natural and simple. Many people are afraid to mix and match patterns as well as texture. It can be frightening because, if done wrong, it can be awful. However, if done well it looks great (even amazing). A few simple ideas should keep you pointed in the right direction. 1. Texture- texture can be really fun to play with, especially on a monochromatic scheme. This can be introduced as quilting on a place-mat, weaving on a napkin, or even on a charger with jute and metal options. I am introducing texture through a woven Abaca charger. I like the thick braided look, it has a casual hand-made feel, and keeps the table from looking too formal. 2. Color blocking- this has been the new “it word” over the summer. However artists and designers, whether home or fashion, have used this word forever. It has to do with the colors and how they interact with the color wheel. One way to add some pizazz to a monochromatic setting is adding the opposite color on the color wheel as an accent. Whether on a charger, a ring around a plate, or one different color plate, adding a color accent can spice up a boring place setting. I like the look of a simple, white plate. However that can get a little boring, so I mixed it with a beautiful deep red plate. 3. Patterns- Keep your patterns in the same color range. If patterns are kept in the same colors (monochromatic) or coordinate with each other in the patterns, then it will look fine. I used to be afraid of this until I started quilting. In the quilting world, I discovered collections of fabric (usually cut up into different sizes and patterns and renamed into a dessert, like jelly rolls, layer cakes and honey buns…yum!). Even though they are all different patterns and colors they all coordinate because they are all using the same common colors throughout. I then added another layer, with an unexpected surprise using vintage American plates. These beautiful plates are not only decorative, but food friendly as well. These plates are Wedgewood china made exclusively for Avon. They can be found on Etsy, E-Bay, and in vintage stores. Adding a fun plate keeps the table service from looking bland and stale. It is also an affordable alternative to replacing an entire place-setting. The napkins pull from the tablecloth/quilt in terms of colors and the motif on the napkin coordinates well with the motif that is found along the edge of the decorative plates. 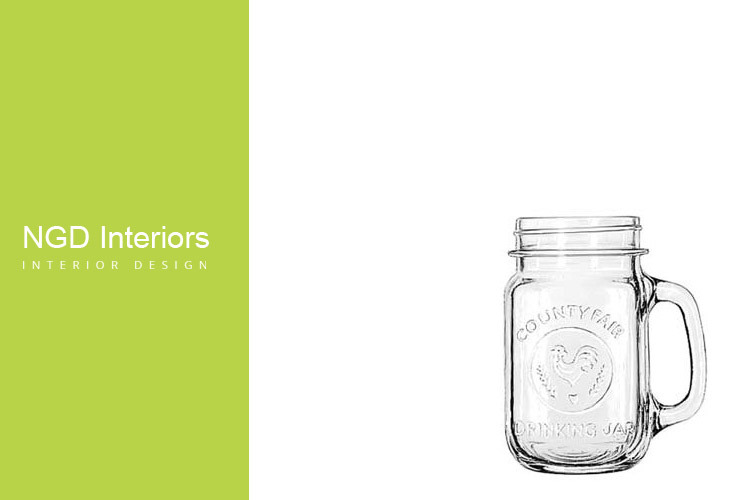 I love the pure, southern simplicity of a mason jar. Plus it comes in a flat of 12 jars, so if one breaks, it’s not the end of the world! I chose a slightly more convenient style that already had a handle. These can be found at restaurant supply stores, or even eBay. I have even found several wedding sets that were auctioned off on eBay. Often overlooked, this is where you can add just a little bit more to your setting. This set of silverware has a pounded metal look on the handle, giving it a casual handmade feel. For this occasion, white works perfectly. You can go traditional, modern, or even playful. I like to do a combination of all three. I like the clean lines and organic shapes with a mixture of traditional pieces. I have also added in carved wood and jute pieces. This adds to the handmade/rustic feel that I want, while also adding texture. These are the little unexpected touches. They would include salt and pepper shakers, napkin rings, place card holders and place cards. Here are a few that I really liked. I added vintage salt and pepper shakers that were souvenirs from the Constitution Center (Liberty Bell Museum) in Philadelphia. They are a fun, unexpected addition to the table. Beaded apple napkin rings- apples=apple pie, what is more American? Place-cards/place-card holders- I loved these handmade, paper cards. They give a whimsical touch to the table, and are held up by silver metal stars. This summer table setting has a great mixture of traditional & vintage pieces juxtaposed with just enough natural elements that give the table an elegant, yet casual feeling that is Americana, without being too “4th of July”. I hope you can have as much fun with your summer table settings, family and friends as I have. If you need any help, feel free to give me a call. I’m always happy to work with you.